Any discourse on slain Punjab governor Salmaan Taseer’s assassination begins and ends with a trenchant critique of the country’s blasphemy law. There is a symbiotic relationship between the two and dealing with both simultaneously has become an inescapable reality. The close association between the death of a governor and the discriminatory nature of a law remains painfully relevant because it evokes dark memories of violence and bigotry. Taseer’s assassination strikes a raw nerve and reminds the world of an injustice that put the cuffs on a Christian girl who had allegedly passed derogatory remarks against the Holy Prophet (PBUH). It also plucks at the memory of a schism that gripped Pakistani society after the former governor’s death and heightened pre-existing tensions between the religious right and liberal left. Five years after Taseer was killed in a hail of bullets by his bodyguard, Mumtaz Qadri, the political scenario has changed drastically. Following the attack on the Army Public School in Peshawar, the federal government decided to lift a seven-year moratorium on the death penalty to clamp down on militancy. While the move has been condemned by the EU as a rights violation, it has proved to be a major setback in Qadri’s case. In October 2015, the Supreme Court of Pakistan rejected his appeal and upheld his death sentence. This goes to show that justice may be delayed, but it cannot be denied for too long as there will be a time when changing circumstances will favour those who are driven by their conscience. The move may also affect the long-standing association between the desire to seek justice for the slain governor and the need to prevent the misuse of the blasphemy law. As Qadri’s executions appear somewhat imminent, question marks have appeared over whether this is actually the form of justice that was expected. Can the death penalty radically alter the plight of those who have been short-changed by the law? For a dispassionate observer, Taseer’s battle was against a mindset that exploited minority groups and placed them in a vulnerable position. He firmly believed that various sections of the blasphemy law were a form of black law because courts did not implement them in a manner that recognised the white in Pakistan’s flag. Through his appraisal of the law and his decision to raise a voice for Aasia Bibi, Taseer sought to highlight glaring loopholes in the application of the law. He knew that the problem was equally vested in society and wanted to see a change in the way the functions of the blasphemy law were perceived. A death sentence cannot be the only answer to this battle of ideologies. At this juncture, another verdict has yet to be delivered and it does not necessarily have to come from a court. 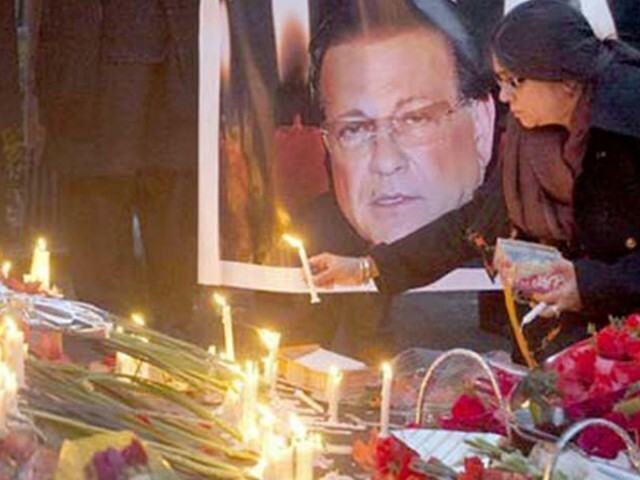 Taseer’s death was the death of reason and rationality. It put a mirror to society’s intolerance for one man’s struggle to alter the interpretation of a legislation that negatively impacted minorities. The judgment for this intolerance has been adjourned for a long time and is the only form of justice for Taseer’s murder and the misuse of a law that aims to protect religion from the assault of a few bigots. Let’s put it more succinctly. Shall we?